Several days ago I promised I’d tell you about a city I saw on HGTV’s House Hunters International. This post is about falling in love with a city based on glimpses in a 30 minute reality TV show. How can that happen? Well, other than being ridiculously impressionable when it comes to cobblestone streets and castle-like turrets, well . . . here’s a photo. See what I mean? Beautiful Maastricht may be the oldest settlement in the Netherlands. 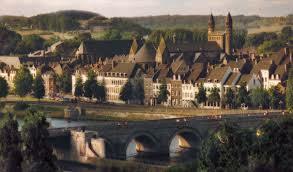 It’s located on the Meuse River, practically in Belgium and just a stone’s throw from Germany. Archaeologists have discovered Neanderthal and Paleolithic remains in the area (we’re talking up to 25,000 BC, folks – or even earlier). The Celts dropped in later around 500 BC and the busy Romans put their mark on it sometime in the first century AD. If you visit the main library you can see Roman coins, jewelry, pottery shards, etc. and around the city there are remnants of a bridge, a granary and – what else? – a Roman bath (see my Splish Splash post for more about the ubiquitous Roman baths). When I visit, what I really want to do is wander around the city center of old town Maastricht. The Vrijthof Square dates from medieval times, when pilgrims came to pray at the grave of Saint Servatius. You don’t hear much about Servatius these days, but he apparently warranted a pretty fine cathedral. The Romanesque St. Servatius Basillica is adjacent to the picturesque square and the area is now temptingly packed with fine restaurants, outdoor cafes and shops. 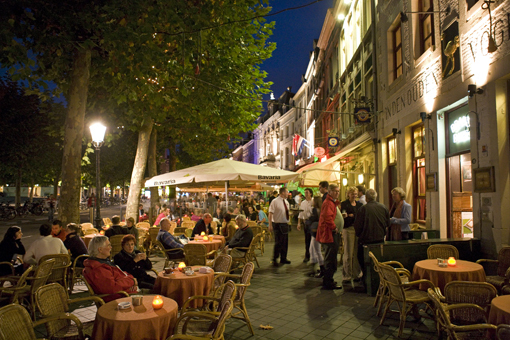 As an aside, Maastricht is the capital city of the province of Limburg. Are you familiar with Limburger cheese, which originated in this lovely area? It may well be the world’s stinkiest cheese and rivals the aroma that wafts from the tennis shoes of 12 year old boys (I know I’m not the only mother who made her son leave his shoes in the garage before entering the house for that prepubescent year or so). Anyway, my parents occasionally hosted stinky cheese parties where the adults would sit around the kitchen table wolfing down Limburger and crackers and drinking beer. We kids would huddle together in the family room watching cartoons and holding handkerchiefs to our noses in a vain attempt to block out the odor. So, other than a slight fear of running into people eating stinky cheese, I really want to go Maastricht in the lovely province of Limburg. When I checked online I learned that the city’s only about an hour away if I fly into Brussels, Düsseldorf or Cologne. I think it would be great to rent a car and take the opportunity to explore the area. You wouldn’t have to drive much to see gorgeous and not-so-touristy parts of the Netherlands, Germany, Belgium and Luxembourg – all comfortable little day trips from Maastricht itself. One of my excursions would be to Aachen, Germany. This ancient and westernmost city in Germany was once home to Charlemagne. I would love to see the great ruler’s magnificent Palatine Chapel, which began construction in 792. Whoa. Do I sound like a historian, or what? I actually saw the gorgeous Palatine Chapel on a reality TV show, too. I was every bit as surprised as supermodel Cindy Crawford was to learn that she is a descendant of Charlemagne on TLC’s Who Do You Think You Are? Will you respect me more if i tell you I also watched a three-part series on Islam on PBS? I’m not completely shallow, but you could certainly describe my taste in television (and books) as eclectic. But listen, have you been to this part of the world? If so, please send me your suggestions. I’d love to learn of more places to visit when I plan this trip. Happy travels to you! This entry was posted in Travel and tagged Belgium, Charlemagne, Cindy Crawford, Germany, HGTV, Limburger cheese, Maastricht Netherlands, Roman Baths, St. Servatius Basilica, TLC. Bookmark the permalink. So strange to receive this since you are not my son, but hey . . . thanks for the comment! I just visited Maastritch today and went without my tour book. Landed in the wrong part of town–a lovely church made into a bookstore in a shopping mall with a massive shopping area around it–the horrible traffic jam entering the city as street was under construction did not set the correct mood. Decided after getting no where on seeing the beauty the city was obviously to have that we would leave and go the the American cemetary in Henri Chapelle area to pay our respects. We stayed in the Eifel area and must suggest you explore that area as Rick felt Rothenburg was too whatever these days. I suggest you go to Monschau, Bad Monstereifel, Ahruweiler as possible alternatives. Kommern’s open air village is charming as is the city it is named after. Eifel National Park was a bit overwhelming but we did go to the Vogelsang. We are not the best for outdoor massive hiking but it is there. This area is so medieval with walled cities abounding we are exhausted after the week. Word of warning while driving through small towns–50 kph is the speed limit and there are cameras to get you on photo if you go 10 over–ie 36 in the usual 30 mph. I hate to see what we owe. Barbara, thanks so much for the great information! I can’t wait to look up the places you’re recommending. I’m not much of a hiker, either, so I will be especially careful with the speed limits and hope your bill is a small one. (1) Use your computer to look into the extensive video programming on high-quality,commercial-free RTV Maastricht, Maastricht’s television station (WWW.RTVMAASTRICHT.NL). I think it’s a wonderful ‘prepping’ station if you are going to spend any time at all in and around that area (as I plan on being for six months or more in April). From the RTV main page (above) click on “PROGRAMMA’S”, then click on the (red font) links in any one of 15 theme-oriented topics to view that topic’s videos. My personal favorite is the topic “Parels uit het heuvelland” (Pearls in/of the hill country”). It’s a series of interviews with people in the districts to the north and east of Maastricht. 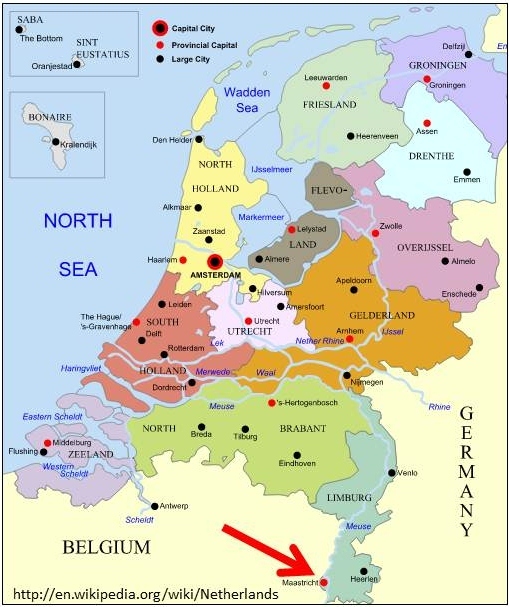 For orientation, these regions around Maastricht are shown on a map at the beginning of each video. In these interviews you’ll see the landscapes around Maastricht, the people, the events, and the ‘tourist sites’ in the region. The Dutch are creative people, so be very sure to watch for the very entertaining “lip-syncing” local people in each of the videos’ music section. (2) Use the YouTube language videos to see-hear-learn the vowels and consonants of Nederlands (the language is officially no longer called ‘Dutch’), as well as the basic forms of saying “please” and “thank you” in their language, especially if you’re using German as a ‘cross-over’ language. Like French, many words in Nederlands are spelled one way, but pronounced quite differently than one would expect. For example, “goede morgen” is pronounced “who-duh more-hen” because in Nederlands the “G” is velar, not gutteral as in German. Beyond that, you’ll be able to converse in English (the international ‘lingua franca’) with most of the people you’ll come in contact with in the region; it’s definitely a multi-lingual region there (Nederlands-German-French-Flemish-Luxembourgish-Limbergerish- and English, too). (3) The standard U.S. – to – Maastricht direct flight routing on the flight planning websites is via Germany as port of entry. An interesting alternative is to fly into Brussels from the U.S., spend some time in that city (to see the famous “Mannekin Pis”, for example) then take one of the 11 daily trains from Brussels’ central station to enjoy the 80-minute train ride to Maastricht through the Belgian countryside. (4) If your plans include renting a car and going on to Germany from Maastricht by auto, you might think about going south to Luxembourg first and then driving to Germany along the Mosel River to Koblenz. Rick Steves claims in his video about that trip along the Mosel is an excellent alternative to doing the Rhine River drive, with castles and everything else that you’d see along the Rhine If you use Google maps you’ll be able to view the satellite view to get an idea of the roads and geography, but also the almost shoulder-to-shoulder inns, hotels, and B&B’s along that less tourist-travelled river route. Thank you, Ken – what great information! I have been fortunate to visit Koblenz and sailed along the Mosel, Main and Rhine on a Viking river cruise. Great way to see that area but I definitely would like to drive and see more at my own pace after that little taste of the area. We actually started that trip in Luxembourg City, then boarded at Trier – another wonderful, historic city I’d love to return to. Add that to your list, if you have the time. I also have visited Brussels, Antwerp, Gent and Bruge on yet another river cruise that took us through parts of the Netherlands and Belgium. How wonderful for you to have the opportunity to spend six months in the area next spring! That, of course, would be the ideal way to travel. Another blog I enjoy reading is http://www.montgomeryfest.com. This is written by a young American couple living in Brussels – great photos and stories about their life there, as well as adventures in the countries beyond. Again, thanks for writing – and very best wishes and happy travels to you! I came across your post in a fluke but, just had to say I liked it. As an American living in Maastricht, I just have to say, I love it. It’s rich in historical charm and architecture. Every day I consider myself lucky to live here as I go about my business. I highly suggest a visit if your in the area. Although, I would suggest getting off the vrijthof if you want less touristy food. There are some great shops and restaurants in the jeker qwartier and the wyck neighborhoods (directly across the river from each other). The jeker has plenty of great historical gems to check out and photograph as well. Be sure to check out the helpoort (hells gate) and learn the story of the fijvkoppen (five heads), a daunting tale. Aside from all the Maastricht sites, if suggest it as a central location for other day trips besides Aachen. I would suggest venturing into the Ardennes in Belgium, if possible. Plenty of great towns / villages to visit with great views, great food and of course great Belgium beer. One of my favorite small towns is Durbuy, BE – for all the reasons mentioned and only an hour drive away. Hi Misha! Thanks so much for commenting and for all the great information. I’m going to copy and paste your message into a Word doc I can save in my Travel folder. 2014 is going to take me to Brisbane, Australia for my son’s wedding and to the U.K. to manage a tour featuring fiber arts workshops in Yorkshire. A dear friend who lives on the Isle of Man might be over in August and that will mean flying out to Colorado for a road trip there. Returning to Belgium and the Netherlands in 2015 would be wonderful and your intriguing recommendations make me yearn to plan that trip more than ever before. Thanks again and happy new year to you, Misha! found your post the day after I returned from a trip to DE/NL and am coping with being back on US soil by bingeing House Hunters Int’l. I googled to see if there was more than one Maastricht episode (sadly, it seems not) and found your post. I also second Misha’s recommendation to visit the Helpoort. That area of town is my favorite!